Love in the Time of Monsters is a suspenseful, campy, hilarious horror film that weaves an outrageous tale of love and Zombie Bigfoots through the dark woods of Northern California. While Love in the Time of Monsters is violent and scary at times, its major themes are sacrifice, courage and forgiveness; imagine if Peter Jackson and John Hughes cocreated Night of the Living Dead or Aliens. Two sisters travel to a cheesy tourist trap where they battle toxic monsters dressed in bigfoot costumes in order to save the ones they love with the help of Bigfoot himself! What a ride. Shot in the redwoods of Northern California, Love in the Time of Monstersis the first appearance of horror legends Doug Jones and Kane Hodder in the same film.The film packs all the punch you expect, but also delivers quick banter, skilled performances and a boatload of fun by all the actors. It has all the blood, babes, terror, mayhem and laughs that any genre movie fan would love and if you miss it in theaters, don’t worry, you can catch it on DVD/and or VOD starting February 17th! TBC FILMS consists of: Matt Jackson (Director), Andy Gunn (Producer) and Mike Skvarla (Writer). Longtime friends who accomplish two things simultaneously with the film: it both pays homage and reimagines the classic monster movies and horror/comedies of the past like Tremors, Shaun of the Dead and Evil Dead 2. They wanted people to be scared, but have a blast doing it! Director Matt Jackson says: "the movies I really love are those fullhearted, actionpacked movies from my youth. With healthy doses of comedy mixed between heaps of horror and drama, Love In The Time Of Monsters is a love letter to those movies I grew up with. But it’s not just a nostalgia fest; although I took cues from the past, I wanted to show the audience something it’s never quite seen before, and something that will stand out on it’s own." "The filmmakers are confident, gifted and have made a great genre movie outside the Hollywood system. This film typifies the kind of Independent filmmaking that is global in its approach and thinking." (Jeff Benegar, Indican Pictures, Executive). For more information about LOVE in the TIME of MONSTERS please visit the official website www.loveinthetimeofmonsters.com or http://uncleslavkosfuntimeblog.com/. Indican Pictures will release the action film The Waiter in February 2015. The Waiter is the final film of beloved character actor Charles Durning, a versatile Golden Globe winner who achieved success in a wide range of fields throughout his long career. Durning was a professional ballroom dancer and accomplished theatre performer who wona Tony Award for his 1990 performance in Cat on a Hot Tin Roof, and he is remembered for his Oscar-nominated turns in The Best Little Whorehouse in Texas and To Be or Not to Be. In addition to his renowned work on the stage and screen, Durning was a World War II U.S. Army veteran, having been awarded the Silver Star, Bronze Star, and Purple Heart Medals for his service. Furthermore, Durning was nominated for nine Primetime Emmy Awards, and he played memorable roles in the classic films The Sting, Tootsie, and O Brother, Where Art Thou? After an Enron style scandal ruins his career, a simple man known only as "The Waiter" floats from job to job, having lost his purpose in life. While working in a big city, he encounters a woman who starts to help him climb out of his own depths of hell. When someone threatens to hurt those close to him, little do they realize that this "Waiter" is a former Military M.P. who decides enough is enough. Watch as he battles not just for his life, but for the lives of the innocent people around him! 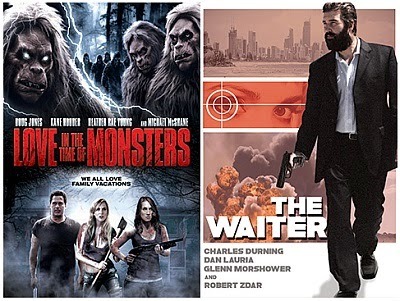 The Waiter received the Best Feature award at the Cleveland Indie Gathering, where Robert Z’Dar and Jason Konopisos also took home the Best Supporting Actor and Best Director prizes, respectively. In addition, the film won Best Feature Drama/Thriller at the Bare Bones International Film Festival, as well as the Gold Remi at WorldFest Houston. The Houston Chronicle praised the cast’s "strong acting," and DVDTalk asserts that The Waiter is"loaded with great action."